POLOGNE – Plock - More human remains from burials in the period from the 12th to the 18th century have been discovered during the renovation of the oldest school in Poland and one of the oldest in Europe, the Marshal Stanisław Małachowski High School in Płock (Mazowieckie). Excavation work coordinator archaeologist Dr. Marek Barański told PAP that in the immediate vicinity of the foundations of the Romanesque Collegiate Church of Saint Michael the Archangel, archaeologists found the remains of about 70 people, including children, in successive layers. Earlier, in February, in the basement of early school buildings - in preserved part of the collegiate church and adjacent area, archaeologists discovered the remains of about 100 people. "Remains recently discovered on the south side of the Collegiate Church confirmed that this was the location of a large cemetery complex, where the people of Płock were being buried since the early Middle Ages" - Dr. Barański told PAP. He explained that the oldest burials were found at a depth of about two and a half meters in the layer from the 12th and 13th centuries, and others in successive layers to the most recent one, dating back to the 18th century. TURQUIE - Hekatomnos - A new project to reveal the history of 2,400-year-old tombs in the southwestern province of Muğla’s Milas district will not only focus on the area’s rich archaeological heritage, but also the historical attempts to rob the graves. The area and the tombs were robbed in the past, and the materials and the tools used in the robbery are also of important archaeological value. 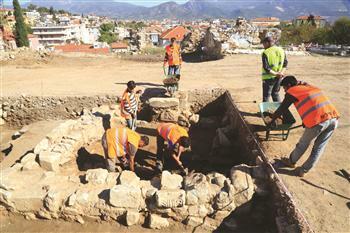 These tools will be exhibited in new project.Muğla Monuments and Hekatomnos Monument Science Association coordinator academic Abuzer Kızıl said, the area, which is really important for archeological history, is home to archeological findings, perceived to be among the most important findings within the last 100 years. The tombs date back to 2,400 years and are very important findings, with excavations still continuing on them. ROYAUME UNI – Darlington - A site behind Darlington’s town hall is being excavated in preparation for the building of a new office block for the Department for Education Archaeologists working on the site have uncovered artefacts they believe may date back to medieval times. A site behind Darlington’s town hall is being excavated in preparation for the building of a new office block for the Department for Education. Archaeologists working on the site have uncovered artefacts they believe may date back to medieval times.A horse’s head together with a spur has been recovered from an area thought to have been an ornamental pond that would have stood in the gardens of the house. It is thought the manor house was demolished and its remains used to build a workhouse in around 1808. ITALIE – Naples - A marble statue depicting a female that probably dates between the first and second century CE has been discovered in the Bay of Naples by an underwater archaeologist, according to culture authorities in Italy. The sculpture, which depicts a female figure smaller than a life-size equivalent, is fractured in various location and is missing the arms. The discovery was made by researcher Gabriele Gomez de Ayala, who works for Naumacos, Underwater Archaeological Research and volunteers for various State culture departments.